One of the more startling cultural divides between Americans and the French (and Italians, for that matter) remains their respective views on the dandelion. Americans regard the plants mostly as pests; they want only to kill them. The French, however, prefer to eat them. I can recall dandelion traumas in Weston, Massachusetts, where, readers may remember, I first got fat as an exchange student; and years later in Dix Hills, New York, where Edward grew up. Both communities have well-manicured lawns and gardens. The sight of a dandelion on a lawn is met like the eruption of a pimple on a teenage girl’s nose: bring on the chemical warfare, consult the experts, kill, kill, kill before it spreads. Dandelions may do nothing for the beauty of Kentucky bluegrass, but their greens are tasty things. Fortunately, there are signs that the gourmands are gaining on the lawn doctors. More and more it is possible for a little French girl in New York, or anyone else, to buy a bag of wild dandelions (or pick some along roadsides or unkempt lawns!). What a treat you have in store, whether enjoying them raw in a salad or sautéed with a bit of olive oil and lemon, as they are served in Greece. Whisk together the shallot, mustard, vinegar and anchovy. Season with salt and pepper to taste, and whisk in the oil in a slow stream. 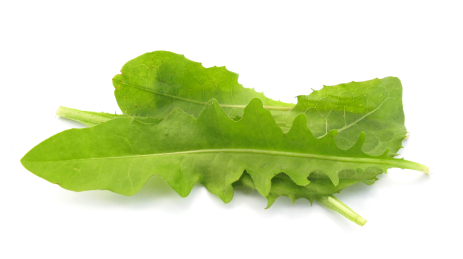 Toss the dandelion greens with the dressing, and top with Parmesan shavings (you can shave the cheese with a vegetable peeler).